While many different emergency situations can occur in buildings that require quick evacuation, we have seen a notable rise in fire-related incidents in the country’s CBDs. During an emergency situation, there are high risk factors such as smoke inhalation (in the case of a fire), stampedes and falling debris. The ExiSAFE system offers occupants an effortless, fast and safe exit from a building, preventing injury and ultimately saving lives. The ExiSAFE array of surface mounted panic and emergency exit solutions includes a Panic Latch and Panic Bolt for single door applications, a Panic Set for rebated double doors as well as Push Pad Emergency Latch and Outside Access Devices (OAD). Manufactured in the UK and backed by a 10-year guarantee, the product is certified for fire doors to deliver quality, setting the benchmark in panic and emergency hardware. ExiSAFE adheres to all international fire safety and quality standards including the Certifire independent testing quality mark, fire rating and CE mark for safety, as well as BS EN 179 and BS EN 1125. 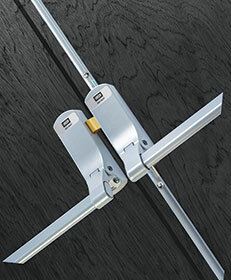 The push bar and bolt rods can be resized on-site to ensure a seamless door match. The push bar features a closed-arm design reducing the risk of finger trapping. Elwen also notes that universal handing ensures easy, hassle-free installation and adds that the ExiSAFE hardware can also be easily retrofitted to existing fire and emergency escape doors. Antithrust technology in the device does not allow any manipulation from the outside. In addition, sheer screw technology on the Outside Access Device (OAD) lever handle and free swing technology on the OAD knob also prevents manipulation. These enhanced security features ensure peace of mind knowing that no intruders can enter through the emergency escape door without compromising the safety of the building’s occupants.